Goofus and Gallant is a cartoon feature that has appeared (in varying versions) in Highlights magazine since 1948. Do you remember reading Highlights for Kids magazine? Like millions of American children, I discovered Highlights in the waiting room of the doctor’s office. Nestled among an array of magazines for grown-ups, Highlights was fun to read because it was especially written for kids. One of the magazine’s regular features that I enjoyed was a cartoon called Goofus and Gallant. 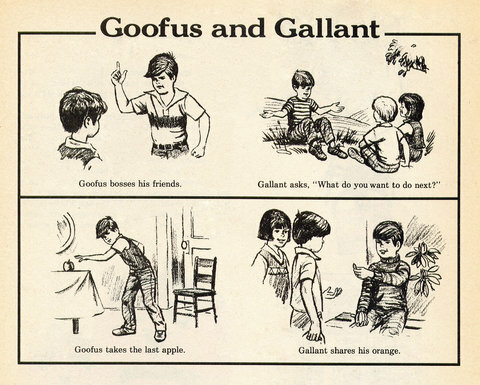 The cartoon showed side-by-side panels of two boys: Goofus, the boy who always made a poor choice or acted selfishly and his counterpart, Gallant, who always made a better, more thoughtful choice in a similar situation. 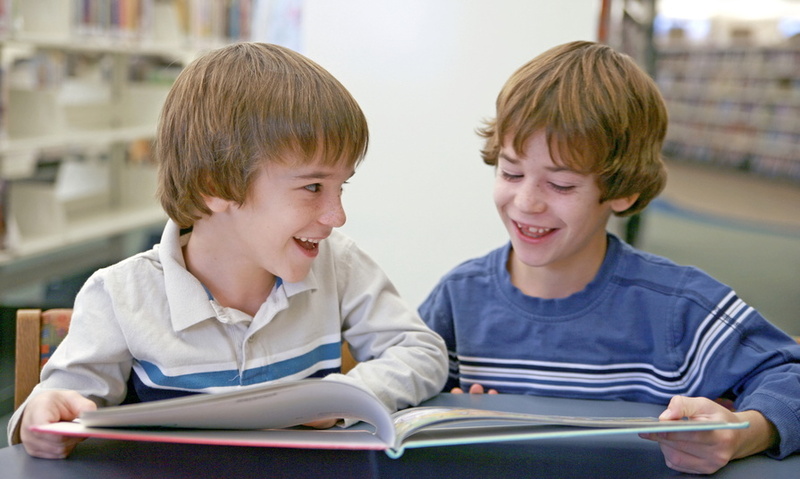 The comparison between the characters was deliberate, with the purpose of teaching and assisting children to identify positive character traits. I have to admit that I always found it somehow satisfying to compare Goofus with Gallant. Easy to cast judgment upon, I could always imagine devil’s horns on Goofus’ head, while Gallant wore a halo. The contrast between the two was night and day; the bully versus the teacher’s pet. I even noticed the way that Goofus’ hair had a little upturned wave to it, compared with Gallant’s clean, controlled cut, and how each boy’s facial expression mirrored his true nature. And of course, I couldn’t help but consider and know that if I were presented with the same sets of circumstances, I would make the kinds of choices that Gallant made, even if Gallant was a little too saintly. After all, Goofus was far too selfish and thoughtless, and sometimes downright mean. But life is not always so black and white, and sometimes we struggle with the choices we make. We usually want to do what’s right, and most of the time doing what’s right comes easy. At other times we are challenged, because doing the right thing means putting needs or desires of another before our own. We want to be Gallant, but sometimes we knowingly make Goofus choices. We juggle between Self and Other. That is part of what it means to be human. And it isn’t easy to be Gallant when we live in a society that values Goofus behavior. Think about it. To be Gallant is to be seen as the “goody two-shoes”; weak, compliant, selfless, a rule follower, maybe even a pleaser. While the Gallants in society are anything but weak, and in fact possess great strength and self-control, they are the members who are often rewarded the least by society. They are people who are concerned with helping others. They are the teachers, caregivers, healthcare workers, emergency service providers, and military service personnel. They are law-abiding citizens who pay their taxes and support their communities. They are moms and dads who put their children and elderly parents first. They are people who want to make a difference and do. In contrast, society sees Goofus as the rebel or a maverick who takes control and goes after what he wants. He does not hold back when it comes to taking care of himself. The Goofus’s in our society are admired for their strength and ability to achieve. They often attain positions of leadership (which they often abuse) and are rewarded with financial wealth. Goofus’s don’t care how many heads they have to step on or how many rules they have to break as they climb the ladder to the top. They are bullies and manipulators who look out for Number One. Ironically, these are the members of society who often excite us and grab our attention; we want their power, success, and wealth, even though we question their values and character traits. While it can be easy to create stereotypes of human behavior exemplified by Goofus and Gallant, it is more accurate to say that each of us demonstrates a range of behaviors that fall between Goofus’ and Gallant’s. Goofus and Gallant illustrates that we always have a choice. Each day we are presented with a variety of decision-making moments. Whether facing important or trivial matters, we possess the ability to think and feel before we act. That’s part of being human, too. To show children from an early age that they have the power to choose actions that will bring about positive outcomes and shape lasting positive relationships is to give them a key to understanding their true nature and strength of character.